You can import questions into Articulate Storyline to save development time. This is especially helpful when subject matter experts draft questions for you. 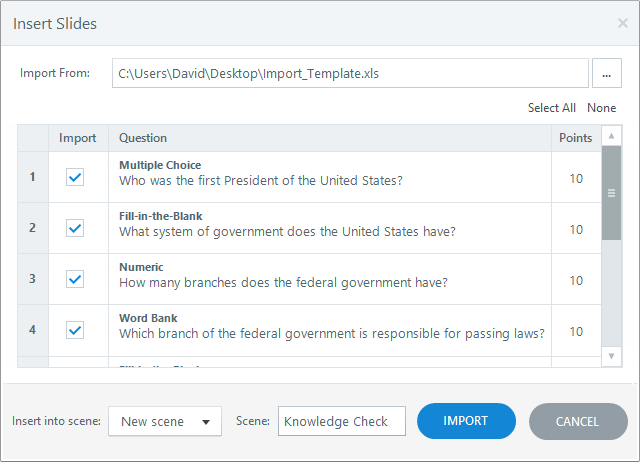 Enter the Question Type, Points, Question Text, and Answer Choices for each question. See the table below for notes regarding each field. Points are required for graded questions. Enter points for the correct answer. Points can range from -1000 to 1000. Points for incorrect answers aren't supported via import. Question text is required for all questions. Answer choices are required for all question types except Short Answer, Essay, and How Many. Enter up to 10 answer choices for each question. Designate correct answers for graded questions with an asterisk (*) at the beginning. For choice-level feedback, separate each answer choice and its feedback with a pipe (|). Example: Houston | Sorry, the capital of Texas is Austin. For matching questions, separate each answer choice and its match with a pipe (|). Numeric questions only support "Equal to" answers via import. Open an existing course or create a new one. Go to the File tab on the Storyline ribbon, scroll to Import, and choose Questions from File. Go to the Home tab on the ribbon, click New Slide, select Import on the left, and choose Questions from File. Go to the Insert tab on the ribbon, click New Slide, select Import on the left, and choose Questions from File. Browse to the Excel workbook (XLS or XLSX) and click Open. Storyline displays a list of questions from the workbook you selected. Mark the ones you want to import. Use the Insert into scene drop-down at the bottom of the window to choose where the question slides should appear in your course. You can insert them into a new scene, which is the default option, or choose the current scene in the open project. If you choose a new scene, use the Scene field to give it a name. Tip: You can't initially import questions into a Storyline question bank, but you can move them into a question bank after importing them into a Storyline scene. Click Import to complete the process. If there are any errors in your workbook, Storyline will list them. You can click Continue to import the questions that don't have errors and skip those that do, or you can click Cancel to correct the errors in your workbook and import it again. Formatting in your workbook will be removed during import (italics, font size, hyperlinks, etc.). Storyline will only import questions from the first worksheet (tab) in your Excel workbook. Additional worksheets will be ignored. The more questions you import, the longer it'll take to process and create them in Storyline. Download this template. (Tip: Right-click the download link and choose Save link as from the context menu.) A sample question is provided for you in the template. Enter the Question Type, Points, Question Text, and Answer Choices for each question. Enter each item on a new line in the text file. See the table below for notes regarding each item. Browse to the text (TXT) and click Open. Storyline displays a list of questions from the text file you selected. Mark the ones you want to import. Click Import to complete the import process. If there are any errors in your text file, Storyline will list them. You can click Continue to import the questions that don't have errors and skip those that do, or you can click Cancel to correct the errors in your text file and import it again. Text that follows two forward slashes (//) is identified as a comment. Comments will be ignored during import.